I think that if a mom has ever had experienced the happiness that swaddling a baby can bring, she will be forever dedicated to swaddling her babies. It has taken me three babies to realize the importance and sheer bliss of swaddling my children and now that we are on baby #3, I am totally in love with it. However, right now we are in the midst of summer weather and that means one thing...heat. Any mom would (and should) worry about their baby overheating, which is why I am thankful that we have central air in our home. When we go out, I never swaddle Isaac because I am worried about him getting prickly heat and overheating as a result of tight swaddling. For decades, women have swaddled their babies and now-there is a solution to help prevent overheating and allow babies to stay swaddled...even in the hot weather! SwaddleDesigns is a company that specializes in making swaddling blankets. 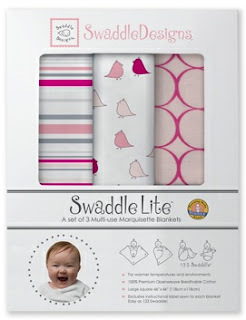 They have recently introduced their newest swaddling blanket and this blanket is called a SwaddleLite. Here is a bit more about this brand new blanket...every mother's dream! SwaddleDesigns was founded by Lynette Damir, RN, Designer and Mom of two in 2002, and SwaddleDesigns was the first company to introduce the large square swaddling blanket to the US market and many markets around the world. SwaddleDesigns is known for their premium quality fabric, fabulous colors and prints, and the innovative 123 Swaddle® instructional label that makes learning how to swaddle so easy. SwaddleDesigns versatile blankets come in a variety of weights and are perfect for many uses such as a privacy throw for breastfeeding moms, a tummy time play mat, a cover over the stroller. SwaddleLite contains a set of 3 lightweight breathable openweave high quality cotton Marquisette Swaddling Blankets in a gift box. Especially during the warmer months, parents are looking for very lightweight cotton blankets. Marquisette is an ideal fabric for swaddling in warmer environments and climates. The open weave cotton fabric is breathable and allows for airflow. SwaddleDesigns marquisette has a very soft hand. SwaddleDesigns marquisette is custom made using superior quality cotton yarns created from long, smooth, high quality cotton. Moms love SwaddleDesigns beautiful colors and attractive prints. SwaddleDesigns products are known for their great quality and long lasting value that moms and babies love and enjoy for years. SwaddleDesigns is also well respected by the medical community – often recommended by pediatricians, nurses, doulas, newborn care instructors. I would also love to introduce you to Harvey Karp...he is the creator of "The Happiest Baby On The Block" and is the inspiration behind the SwaddleDesigns company. Here is some information about an upcoming program that SwaddleDesigns is proud to be a sponsor of...starring Dr. Karp! SwaddleDesigns is proud to be selected by Dr. Karp, Author of The Happiest Baby on the Block, as a sponsor for his upcoming “Parents Night Out” theatrical event. NCM Fathom, SwaddleDesigns and BabyCenter present a special live event, Parent’s Night Out with The Happiest Baby & Happiest Toddler, starring Dr. Harvey Karp, on Thursday, June 21 at 7:30 p.m. local time. Expecting moms and dads, parents of infants and toddlers, will want to visit their local movie theater to watch as Dr. Karp reveals the surprising tips and tricks that have made his celebrated books and DVDs among the top parenting guides in history. Audiences will enjoy live demonstrations, watch footage of parents in action, and take part in a hot-topic parent Q&A session. Families will learn simple solutions to help them raise happy, well-behaved young children – and get more sleep, too. Tickets are on sale. You cannot even begin to imagine how thrilled I was to be able to review these brand new blankets and share them with you! If you are a mom (especially a new mom) - these swaddling blankets are for YOU!! So, for this review I was sent a set of 3 SwaddleLite blankets and my set is turquoise in color. These just happen to be my favorite color combinations EVER and as soon as I saw them I was in love! :) Don't they look so gorgeous and stylish?!? These blankets are made out of lightweight cotton fabric that is slightly stretchy and VERY breathable. That is what makes them so great for warmer weather. Also, these SwaddleLite blankets are HUGE in size. Honestly, before I was introduced to SwaddleDesigns, my biggest frustration with swaddling was not having a blanket big enough. These measure 46" X 46" and so they are definitely big enough! To give you an idea of just how large they are, take a look at the picture above. My son is 8 weeks old and is still pretty small. You can easily see how these blankets would make great play mats, breastfeeding covers, car seat covers and more! Another feature of every blanket from SwaddleDesigns that I love is the tag that has pictures showing you how to swaddle your baby properly. It is great to have this on every blanket so that you do not forget how to make sure you swaddle correctly each time. Once my son was swaddled, there was no blanket left over and there was also no way he could kick or squirm out of the blanket. It went around him nicely and really was not bulky at all. I absolutely LOVE it!!! 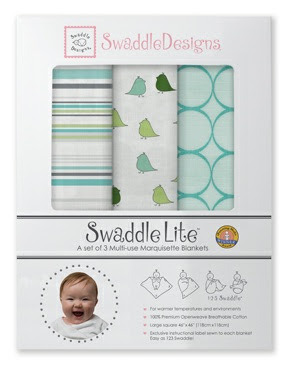 All of SwaddleDesigns SwaddleLite blankets come in sets of 3 and vary in color, design and price ($40 - $48). They also feature Disney and Angry Bird prints so you definitely have a wonderful selection from which to choose. So, in my opinion...SwaddleLite swaddling blankets are the BEST! It has been over 80 degrees all week and I have been very grateful for these lightweight and comfy blankets. My son is so happy when he is swaddled and really, these blankets are by far-the best I have ever seen! I would highly recommend these to any mom who loves to swaddle...you won't be disappointed! Disclaimer: I received no monetary compensation for this post.I did receive free SwaddleDesigns products for review purposes. All quotes and stock photos are from the SwaddleDesigns website and email. Prize is being provided and shipped by the sponsor. All thoughts and opinions are 100% mine. I love the stroller blankets! I would love to have their organic receiving blanket! I love their Jewel Ton Baby Lovies! I like the Cashmere Baby Blanket - Kiwi with Barely Ivory Trim. Love their zzZip Me Sacks! I would love to have one of the adult swaddle wraps. I like the pastel with chocolate brown hooded towel. would love the zzzzzip me sack! The Organic zzZipMe sack looks like it would be so useful! I like the Disney It's A Small World Receiving Blanket. I would love to have some of their Fitted Crib Sheets. So many styles and colors to choose from. I love the zip me sacks! I also love the Zzip me sacks! I like the Disney Grey pastel, swaddleLite. I like the Angry Birds Zzzip sack. One of their fitted crib sheets or the Angry Birds zzZip Sack! Love the sterling owls swaddle blankets! I really like the zzZip me Sack wearable blankets! I'd like a wearable blanket for my daughter. I love their organic selections! The Ultimate Receiving Blanket in baby cheetah print. I would also like the Marquisette Swaddling Blanket - Taupe Gray Sparklers on White. I like the zzzZip me sacks for the post-swaddled baby. I like the Angry Birds onesies! I would love to have the Hooded Towels. I like the cashmere baby blanket. I'd like their Baby Sleep Bundle. I also like the Ultimate Receiving Blankets. I like the hooded towels. I would love to have the SwaddleDesigns - Cashmere Baby Blanket - Pastel Pink with Barely Ivory Trim.